The Winged Victory is over 2000 years old and represents the goddess Nike! 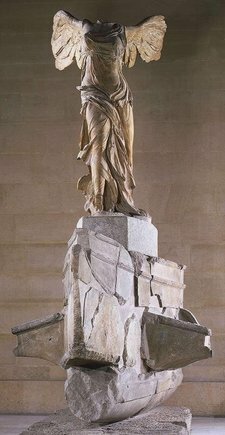 The Winged Victory of Samothrace is an ancient Greek statue found by a French archaeologist in 1863. This sculpture is 2180 years old. She was sculpted in 190 BC to celebrate a naval victory. Her wings symbolize the fact that victory is uncertain and can fly away at any minute. This statue portrays NIKE (like the sports shoes), the Greek goddess of victory, and probably once served as a ship's figurehead. You will find this masterpiece at the head of a staircase in the Louvre.